Purchased December 1873 from the artist by (Durand-Ruel, Paris). Baroux Collection. (Durand-Ruel, Paris), in 1896; Pierre Durand-Ruel [d. 1961] from 1941; his widow, later Mrs. David O. Selznick, New York. (Sam Salz, New York), in 1965. Mr. and Mrs. Konrad H. Matthaei, c. 1966. (Richard L. Feigen & Co., New York); sold 1970 to Mr. and Mrs. Philip J. Levin, New York; gift 1991 to NGA. Provenance according to Wildenstein 1974 catalogue raisonné, volume 1, no. 286. Additional information provided from the Durand-Ruel archives, courtesy of the National Gallery, London (email dated 1 December 2014 in NGA curatorial files). According to Janice Levin, quoted in The Washington Post, 21 March 1991 (copy in NGA curatorial files). Manet-Monet, Galerie Miethke, Vienna, 1910, no. 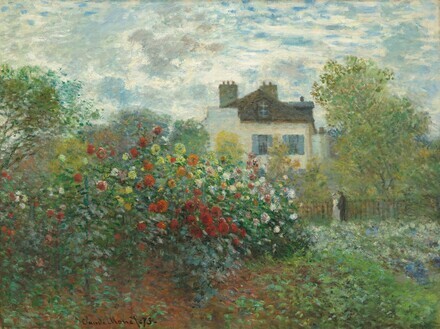 29, as Monet's Garden in Argenteuil. Art Français: Exposition d'Art décoratif contemporain 1800-1885, Grosvenor House, London, 1914, no. 49. Exposition Claude Monet, organisée au bénéfice des victimes de la Catastrophe du Japon, Galeries Georges Petit, Paris, 1924, no. 42 as La Maison dans les fleurs. Claude Monet 1840-1926, Galerien Thannhauser, Berlin, 1928, no. 19, repro. Impressionisten, Kunsthalle Basel, 1949, no. 79. Paintings by Monet, The Art Institute of Chicago, 1975, no. 35, repro. Art for the Nation: Gifts in Honor of the 50th Anniversary of the National Gallery of Art, National Gallery of Art, Washington, D.C., 1991, 166-167, color repro. Claude Monet: 1840-1926, The Art Institute of Chicago, 1995, no. 32, repro., as Monet's Garden at Argenteuil (The Dahlias). The Impressionists at Argenteuil, National Gallery of Art, Washington, D.C.; Wadsworth Atheneum, Hartford, 2000, no. 20, repro., as A Corner of the Garden with Dahlias. A Very Private Collection: Janice H. Levin's Impressionist Pictures, The Metropolitan Museum of Art, New York, 2002-2003, no. 4, repro. Monet's Garden, Kunsthaus Zürich, 2004-2005, no. 11, repro. The Impressionist Eye, Birmingham Museum of Art, Alabama, 2004, no cat. An Impressionist Eye: Painting and Sculpture from the Philip and Janice Levin Foundation, Taft Museum of Art, Cincinnati, 2005, no cat. Monet: L'art de Monet et sa postérité, The National Art Center, Tokyo, 2007, no. 23, repro. Impressionist Gardens, National Gallery of Scotland, Edinburgh; Museo Thyssen-Bornemisza, Madrid, 2010-2011, no. 19, repro. Rewald, John. The History of Impressionism. Rev. ed. New York, 1973: 284, repro. Wildenstein, Daniel. Claude Monet. Biographie et catalogue raisonné. 5 vols. Lausanne and Paris, 1974-1991: I:no. 286. Tucker, Paul Hayes. Monet at Argenteuil. New Haven, 1982: 143, repro. Bailey, Colin B. Renoir's Portraits: Impressions of an age. Exh. cat. National Gallery of Canada, Ottawa; Art Institute of Chicago; Kimbell Art Museum, Fort Worth. New Haven and London, 1997: fig. 133. Renoir Landscapes 1865-1883. Exh. cat. The National Gallery, London; National Gallery of Canada, Ottawa; Philadelphia Museum of Art. London, 2007: 135-136, fig. 78. Harris, Neil. Capital Culture: J. Carter Brown, the National Gallery of Art, and the Reinvention of the Museum Experience. Chicago and London, 2013: 422.